Hyderabadi Chicken Biryani is a dish I grew up eating and enjoying. 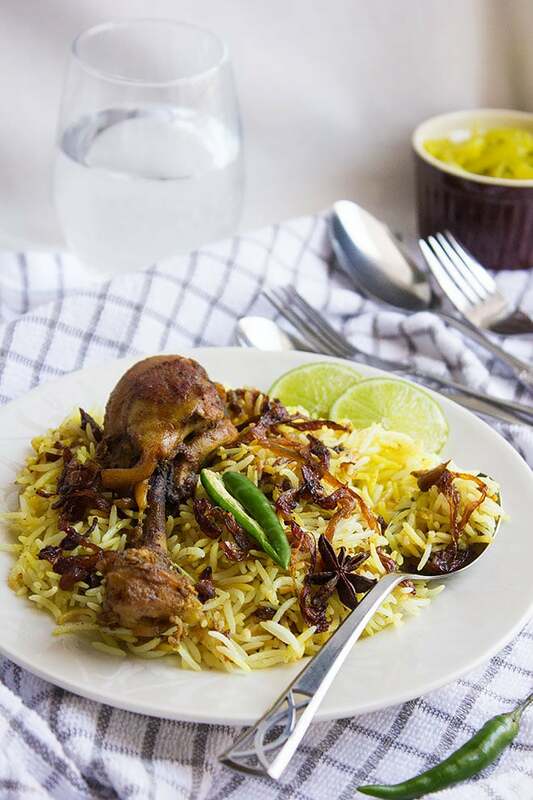 There are many versions of Biryani recipe out there, and I can’t recall eating a biryani that I didn’t like, but there is something magical about Hyderabadi Chicken Biryani, so let’s find out why this biryani recipe is the most popular one in India and a favorite of mine! I have shared in previous posts the recipe for Delicious Lamb Biryani and another quick biryani recipe for Authentic Chicken Biryani both are mind-blowing and are full of flavor. I tend to crave Hyderabadi version more, and you’ll find out why! I guess the secret behind the irresistible taste is the caramelized onion combined with Ghee. As I mentioned in many posts before, when it comes to food, Indian people never compromise the flavor. Using fresh ingredients is the key. Make sure that your spices are always stored properly to maintain freshness, although I have given the option of using oil in this biryani recipe; homemade Ghee is the best to use. Of course, the chicken will taste much better if it was organic. Quality rice makes your biryani stand out; it absorbs the flavor of the spices and the biryani gravy. You can use Parboiled rice, I used it many times in making biryani, and it came out great. 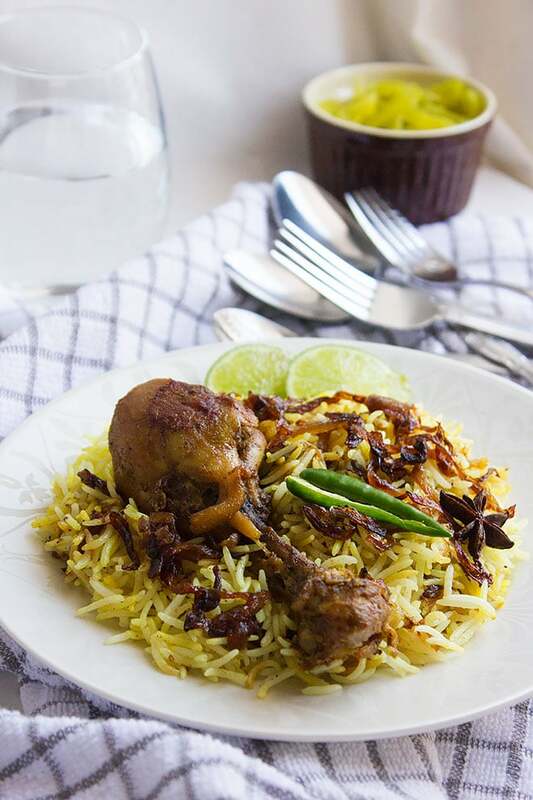 To make a good Hyderabadi Chicken Biryani, you will need to use fresh or organic chicken. Of course, you can use frozen chicken, but if you want the authentic flavor, you have to go with organic chicken. It will absorb the flavor better and stays juicy and tender when cooked. For added flavor, you must use fresh spices. I keep my spices either in the fridge or freezer, I know this might sound strange, but the spices maintain its warmth and flavor for a longer time. Cumin, star anise, cardamom, black cardamom, turmeric, and another blend of spices are used in this recipe. You have the option to use oil in this recipe, but if you are after the mind-blowing taste of authentic biryani then use Ghee. You can make it at home or get some from the store; it makes a lot of difference when is used in making Hyderabadi biryani and some pour a little over the rice in the last stage of assembling the biryani. 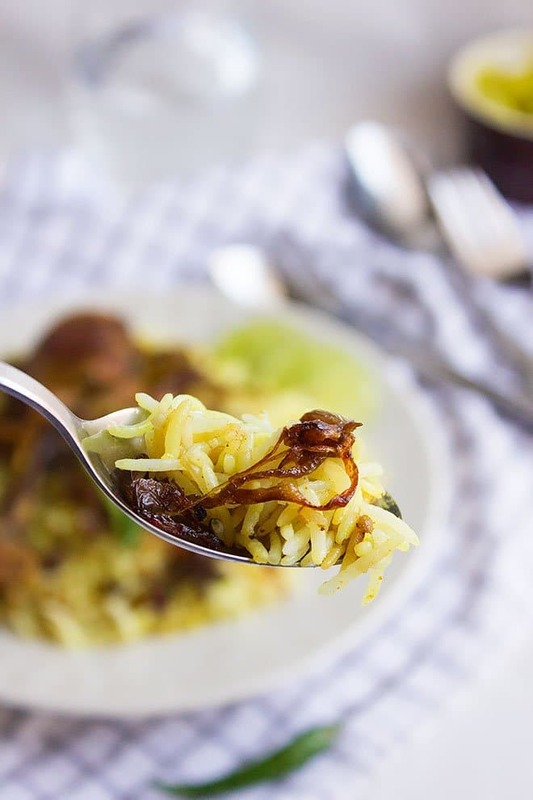 In the steps of making Hyderabadi biryani, you will have to caramelize the onion, which will also work on adding a hint of sweetness to this biryani recipe. The chicken gravy will also include fresh mint, green chili, and garlic. The rice is aromatic and fluffy, thanks to the cardamom and anise seeds. The rice shouldn’t be 100% cooked if it is completely cooked it will absorb so much from the gravy and will turn mushy. Many think that Biryani is one of the hard to make dishes, but the steps are easy to follow, and it doesn’t take much time to prepare. I guess that people get intimidated when they see the list of spices used and not the method of preparing the Biryani. 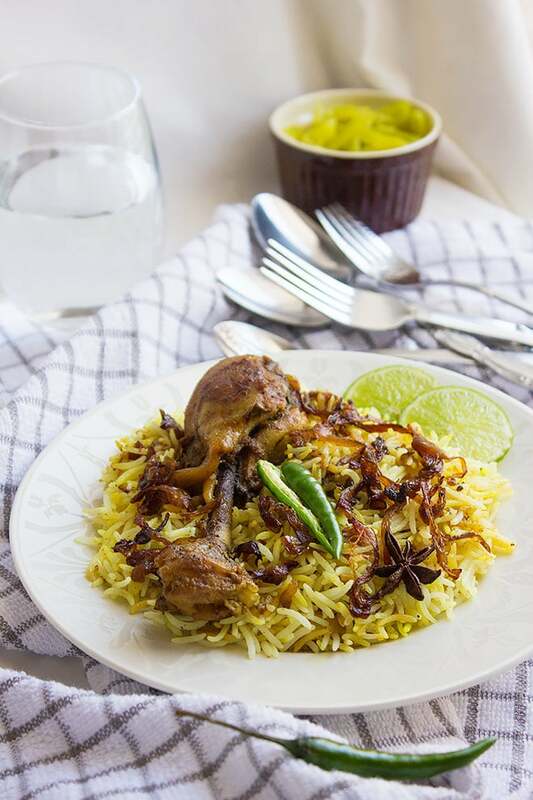 You don’t have to marinate the chicken in this version of Hyderabadi Chicken Biryani; this version is meant to be fast to make and carry the same awesome flavors found in the authentic recipe of Biryani. I couldn’t find much difference in taste when I marinated the chicken. Usually, yogurt is used when marinating the meat for the biryani recipe, it makes the chicken tender and juicy, but we will depend on the flavors coming from the caramelized onion and ghee in this recipe. What is served with Hyderabadi chicken biryani? Biryani is known to be on the spicy side, so it is mostly served with salads that have cucumber, and yogurt. You can try my Yogurt Chickpea Salad or Raita which is an Indian salad consists of yogurt, thinly sliced onion, salt, and black pepper. Aloo Keema Dhaba Style. Ground meat with gravy and potatoes. Hyderabadi Chicken Biryani, one of the popular versions of Biryani in India, in this recipe no marination is required and you'll enjoy tender flavorful chicken with aromatic rice. Wash the rice at least four times until the water runs clear and then rinse. Soak the rice for 15 to 20 minutes. In a pan, add the water, salt, and the spices. Let it come to a boil. Rinse the rice and add to the boiling water. When the water boils again, cover the pan and reduce heat to lowest. Cook for 15 to 20 minutes. In a small pan, add ghee and when hot add the sliced onion. You can use oil if you wish. Now fry the onion until caramelized. This will take around 8 minutes on medium high heat. You must use the remaining ghee or oil from frying the onion in the recipe. Take two tablespoons from the caramelized onion and mince it with the garlic. In a larger pan, add the ghee remaining from previously frying the onion, when hot add the chopped onion and stir until light brown. Add the chicken and fry until you see brown patches on the chicken. Now add the garlic which was minced with the caramelized onion and stir for two minutes. Add all the remaining spices to the chicken and stir for 2 – 3 minutes. Pour 1 ¼ cup water to the chicken and let it cook on medium heat for 20 minutes while covered, and stir occasionally. In the assembling pan, add 1/3 of the cooked rice in the bottom of the pan, then add the chicken then add half of the caramelized onion. Place the rest of the rice on top of the chicken and spread the rest of the caramelized onion over it. Mix the melted butter with turmeric and sprinkle over the rice. Cover and cook on low heat for 5 minutes. I love caramelized onions! I bet that pairs beautifully with the chicken! Sounds delicious! The caramelized onion brings mind blowing flavors to this dish! This looks wonderful, and your plating is lovely as well. I’ve never had a recipe like this one, so I’m definitely curious about it now! One of my favorite dishes. I liked that you used the whole leg. I think it makes for a cool presentation. Yes, it looks good when taking pictures. This looks delicious! My old roommate used to make biryani all the time and I loved it! I have to learn to make it myself now so I’ll give your recipe a try. This looks amazing! I am saving this so I can make it one night next week! I am sure my family would love it. Hey Jessi, I am so sure that you’ll love it! I love spices! 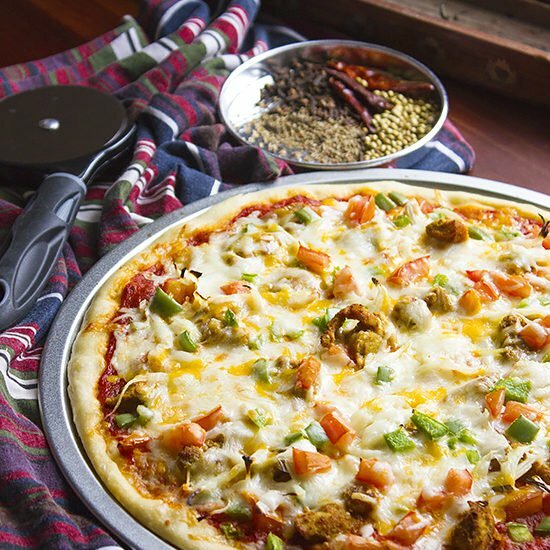 This is perfect for potluck this weekend. Sounds like a winner to me! Mm, this looks so delicious. I need to try and make this. you had me at Biryani. 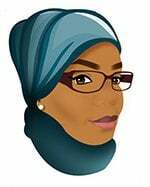 Indian, Pakistani, and Middle Eastern food is my vice, since I grew up in the UAE. I’m saving this one! Yum! Hey Biljana, thanks for stopping by. Let me now when you give it a try! One o f my favorites. You would think its pretty easy, but I have has some really bad dishes over the years. Look for ward to trying this one. This is such a beautiful dish. This made me so hungry the more I read this post. I love spicy food. This looks great but I’ve just gone vegetarian so a vegetable biryani sounds delicious! That recipe sound delicious! I love making different kinds of foods and this is one the I will have to try. Great pictures, it makes it even more appetizing seeing the crispy onions. I have never heard of Hyderabadi Chicken Biryani but it sounds phenomenal! I love that you used turmeric to color the rice, such a neat idea! Wow this looks amazing! I am going to try to make my own this week. It sounds SO yummy, and your pictures make it look heavenly! I will have to let you know how the recipe goes! Oh! Hyderabadi Chicken Biryani looks tasty and interesting to eat. Recipe is now on my list. This looks amazing. I don’t even eat meat but this looks great. Great recipe! I use a few different ingredients as Biryanis from different parts of India do – each one turns out so awesome! This looks absolutely amazing. I’m practically drooling over it right now.